Detroit voters opposed Michigan Governor Snyder 20-1, rejecting his agenda overwhelmingly. Now he has grabbed control of the city. When the voters of Detroit were given the opportunity to decide whether they wanted Rick Snyder to have a role in running their city, it did not go well. Snyder, as the Republican nominee for governor in 2010, finished with just 5 percent of the vote. As in: He lost the city by a 20-1 margin. 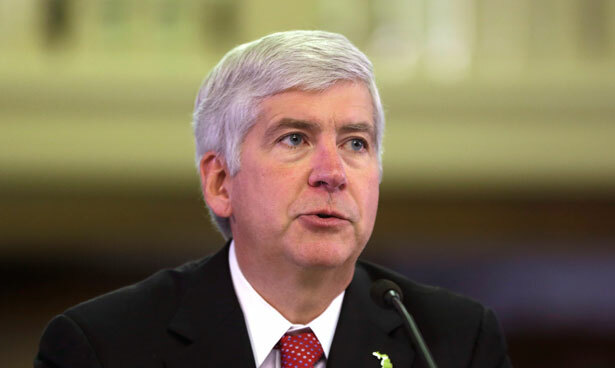 Snyder made up for the deficit statewide and was elected in a “Republican wave” moment. But there is no evidence that the governor or his policies have risen in popularity since then. So, for all the carefully prepared marketing that has surrounded Snyder’s imposition of an appointed “emergency manager” to run the city, for all the pronouncements about how “Detroit Can’t Wait” for state intervention, for all the governor’s talk of his suspending of imposition of an unelected boss as “an opportunity to work together, to bring people together as Detroit, Michigan,” the important thing to remember is that Detroit did not choose to surrender local democracy. Detroit certainly did not choose to hand control over to the appointee of a Republican governor whose 2010 vote wasn’t even competitive. That’s not conjecture. The opposition to Snyder’s agenda has been registered and recorded. The question of whether to eliminate Michigan’s state’s emergency manager law was on the ballot last November. Detroit voted overwhelmingly to strike the law from the statute books; 82 percent of Detroit voters, casting ballots in a high-turnout presidential election, voted against letting the governor effectively replace elected mayors and city council members with a hand-picked appointee. The rest of Michigan sided with Detroit on that issue, and the law was eliminated. But Snyder and a lame-duck legislature disregarded the will of the people and passed the new law that, on Monday, was used by Snyder to impose his emergency manager on the city. On the same ballot last November was a referendum on whether to protect collective bargaining rights so that emergency managers and Republican governors could not bust unions in their push for austerity and privatization. Detroit voted 83 percent to 17 percent in favor of preserving unions. So Snyder has no credibility when he suggests there is even minimal enthusiasm for his imposition of outside control on Detroit—or other majority-minority cities and school districts across the state—as part of a push to undermine union contracts and cut services. Nor, it should be noted, does he have a credible claim of economic necessity: The governor has held up hundreds of millions of dollars in promised state aid funding for Detroit, funding that could help to stabilize the finances of a city that has been battered not by public employees but by the wave of deindustrialization that has shuttered auto plants, parts suppliers and machine shops across the city. It’s important to expose and challenge the austerity lie. But it’s even more important to expose and challenge the assault on democracy in Detroit and Michigan—and, it should be noted, numerous other states. When a city’s voters reject a Republican governor and his agenda, and that governor is still able to shove aside local elected officials and impose his personal appointee to make all the calls regarding how the city is run, democracy is denied. And that denial attacks the most fundamental premises of the American experiment. As Aura Bogado writes, communities of color across the country already live under a certain kind of receivership—the willful hands of the police.